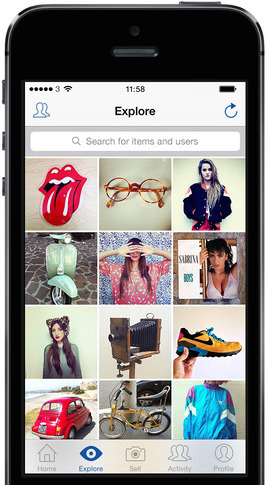 If you haven’t come across Depop yet, think of this app as Etsy meets Instagram. The UK business first launched in 2013 and gained nearly 2 million users in its first year. While that growth may not be stunning compared to say, Snapchat, it’s gained considerable traction with millennials – the demographic that typically drives new channel adoption. Depop is chock full of vintage stuff (100,000 items at the last count). Mostly clothes, but plenty of shoes and a smattering of vinyl records. It works because the app does everything a contemporary mobile experience should do. The Instagram-style layout is easy and familiar. It has a useful set of search tools that add to the product relevance. There are neat little buttons to comment, like and most importantly, to buy the items. It’s almost as simple to sell on Depop. Take a picture, upload it, add a price and off you go. The success of the app comes from this combination of an immediate, frictionless experience and a collaborative approach. Or as their CEO says, ‘it’s designed with the mobile in mind and is social at its very core’. Depop has the opportunity to be distruptive in the retail space. However, collaborative apps are not without criticism. AirBnB rents more rooms the The Hilton Group, but they are not subject to the same taxes or regulations that a traditional hotel chain has (and I won’t even mention the controversies associated with Uber). They’ve also attracted not just those with a spare room for the night, but people investing and making a living from AirBnB properties. Depop also appears to have commercial traders, but thanks to the strong social element, it retains a homely feel. When it comes to vintage retail, the market isn’t dominated by large businesses (unless you count Oxfam), nor does it have many of the regulatory issues that hotels or taxis endure. In fact, the opportunity for Depop is by bringing the vintage market into one neat place, right where their audience is. There’s plenty of optimism for the app. They’ve already ironed out a few complaints about buginess. At the start of the year they gained £5m in VC funding, opened a New York office and hired Ex-Reddit GM, Erik Martin. Whilst Depop are not the only player in the vintage market, it looks as though they have the right UX for the right audience to succeed. ← Are Smartwatches The New Sandwich Toaster?